By Amy Hoover Published in Pilot Getaways Magazine, 2004. Mountain flying often requires flights through deep, winding, sometimes narrow, and randomly oriented canyons. You might fly to an airstrip in the bottom of a canyon, or on top of a ridge or mesa. Or, you might just need to fly through the canyons to get to your destination. In any case, how do you prepare for Mother Nature’s challenges? Primarily, you need to anticipate where air currents will be. The first step, of course, is to get a thorough weather briefing. However, the weather synopses provided by the briefer may not adequately prepare you for the weather factors and phenomena specific to canyons along your route of flight. Deep canyons can effectively separate landing areas that may only be a few miles apart, so weather can vary greatly over a small distance. The factors that affect weather are often very localized, so a flight service station may have no insight into the weather in a particular canyon. When flying in a new area, knowledge from local pilots is invaluable. If two canyons are in the same drainage system, pressure usually equalizes quickly between them and the altimeter setting is nearly uniform. However, local winds and pressure patterns can be very different in river drainage systems only a few miles apart. 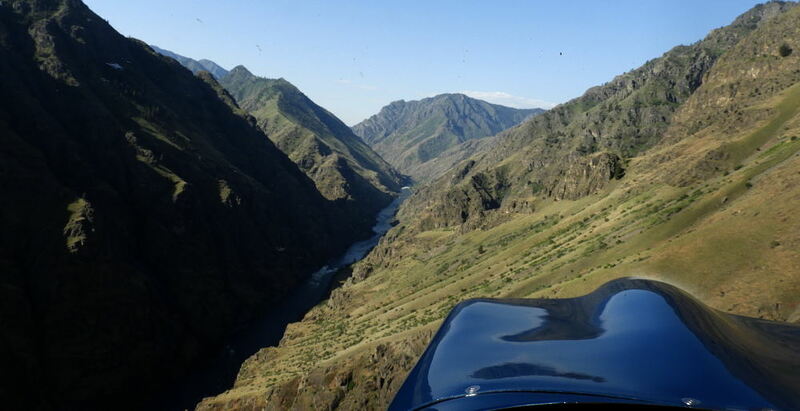 If you fly from one canyon across a ridge into a different canyon that is not connected, there may be a pressure differential between the two canyons. In that case, you can expect wind and turbulence at the divide between the two drainage systems. The different pressure in the new canyon may cause your altimeter to be off by several hundred feet until you get a new altimeter setting. All pilots share the same problem, so be aware that other airplanes may be reporting altitude with a different altimeter setting from yours. Set your altimeter to the field elevation each time you land, and verify altimeter settings with other pilots when passing. If you’re heading toward a region with lower pressure, your actual altitude will be lower than your altimeter indicates. Remember the adage “high to low, look out below,” and don’t necessarily trust an altimeter setting, particularly when a storm approaches. In mountains and canyons, you must know where to find lift and how to use it to your advantage. Fly on the updraft side of ridges and canyons, where there is lift to improve climb performance and terrain clearance. On the downdraft side, you may find a rough ride and downdrafts that exceed the climb capability of your aircraft. Most mountain pilots expect wind to flow down into a canyon and then up the other side, creating an updraft on the downwind side of the canyon. However, that’s not always true since actual lift is the result of the interaction between orographic lift (wind) and solar lift (heat). Additionally, the updraft side may change from one side of the canyon to the other as the canyon twists and turns and different sides face the sun or wind. Orographic lift is mechanical lift created by wind flowing over terrain. In North America the prevailing winds are generally from the west, so you can usually find upslope winds on west facing slopes and downslope winds on east facing slopes. This is especially true with well- defined, north-south mountain ranges perpendicular to the prevailing winds, such as the Cascades, Sierra Nevada, or Rocky Mountains. In areas where more randomly oriented canyons prevail, determining local wind directions and locations of orographic lift are not straightforward. For example, the mountains of central Idaho are formed by a large mass of random ridges cut by deep, twisting drainages. When winds flow over them, the effect is similar to ocean waves crashing over a jumble of rocks: chaotic, unpredictable areas of lift and sink, and greatly varying local winds. Midlevel or ridge top winds can also vary widely and be hard to predict. Sunlit slopes heat up more quickly than the surrounding terrain, causing thermal, or anabatic, lift. Mountain pilots seek out this lift, since it can be quite significant. Early morning lift on east-facing slopes is usually weak and short-lived, but you’ll find better lift later in the day on south- and west-facing slopes that have had adequate time to heat up. Thermal lift usually extends only 50 to 200 feet out from mountain ridges or canyon walls, and is also found directly above ridgelines. This means you need to fly close to the faces of mountains or canyon walls to use thermal lift. Bare rocks and slopes heat up faster and generate more lift than heavily forested areas, so look for the “brighter” slopes. In fact, there may be enough difference in lift between bare slopes and forested areas to cre- ate turbulence at the boundary between them due to the wind shear produced by differential lift. Likewise, expect to find turbulence at the boundary between areas that are in sun and areas in shadow. In summer when the sun is shining on southwest- and west-facing slopes and the wind is also out of the southwest or west, orographic and thermal lift can combine, which greatly augments the lifting force. But what if the wind is blowing from other directions? If thermal and orographic lift work against each other, the results can be much different, depending on wind velocity. Thermal lift will create updrafts on a sun-facing slope, but if that slope is on the lee side of a ridge or canyon, orographic effects produce downdrafts. The updrafts meet the downdrafts and create turbulence. As wind velocity increases, this turbulence reaches deeper into the canyon and can become severe to extreme. In very deep, rocky canyons that are exposed to the sun for a long time during summer days, thermal lift may cause updrafts powerful enough to create a “cushion” of air in the canyon bottom that deflects the orographic downdrafts. This may result in turbulence at any level in the canyon depending on the relative strength of the opposing thermal and orographic effects. Such turbulence is often greatest at ridge top level. Solar lift on the upwind side of the canyon may be stronger than orographic lift on the downwind side of the canyon, depending on temperature and geographic location, thus making it better to fly on the upwind, or “wrong,” side of the canyon. Left: With a light wind, solar lift is stronger than orographic effects, and the upwind, sunny side of the canyon is the best place to fly. Middle: With a stronger wind, rising air from solar lift creates a cushion of air in the canyon bottom. There is lift low in the canyon, but turbulence near the ridge tops. Right: With a very strong wind, solar lift interacts chaotically with orographic effects creating turbulence and unpredictable winds throughout the canyon. Predicting which of these phenomena will occur is difficult, so it is best to stay out of canyons when the wind is blowing strongly. You’ll find local pilots to be a great resource, since they know where and when to expect turbulence and lift. It may be safe to fly with winds of 15–20 knots in one area and not in another. Just when you think you have figured out the effects of wind and sun, and you can find lift, you may encounter some other canyon beasts like diurnal winds, venturi effects, and convergence effects to shake up your flight.